It’s 1949 and Mickey Cohen is the violent mob king who controls LA and it’s up to one small group of cops to bring him down. No warrants, no badges, but lots of guns. The most noticeable thing about this movie is the stylization. The polarized, coloured film isn’t uncommon for the 50s era gangster film, but some of the slowmo shots were highly unnecessary. It’s like a group of film students just got hold of an expensive camera and wanted to capture bullets leaving a gun, or Christmas tree bulbs exploding from a bullet, or cartridges hitting a floor. Was any of that necessary? No. Did it add to story? No. Was it pretty? Yeah, I guess so. Marketed as a good shoot’em up gangster film, I was surprised to discover myself laughing quite a lot. I don’t think it was meant to be as comical as it turned out to be. Sean Penn didn’t seem to get the memo that it wasn’t serious making his hard edged, violent, all too serious gangster Mickey Cohen absolutely wrong for the movie adding to the humour. Perhaps the funniest moment is when Cohen turns to his thugs and says “you know the drill” as he leaves an interrogation, to which they pull out a drill and drill into some man’s head. I never realized that gangsters were so literal in their menacing exits. 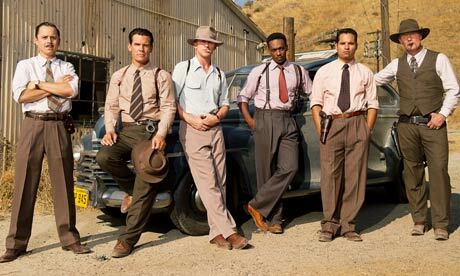 I never expected the phrase gangster squad to be used during the movie, but unfortunately as they’re all sitting around cheering about defeating a few guys they raise their shots and toast to themselves: The Gangster Squad. Oh please never do that again, I immediately lost respect for the writers of this film. A few bad lines wasn’t the only problem I had with the writers, though. If only there had been more backstory for the characters. I understand when there’s a big cast you can’t give everyone a good amount of time, but something more than “I have a pregnant wife” for Brolin would have been nice as he was the main protagonist. The actors did what they could with the lackluster script and I enjoyed the focus on Gosling and Stone, but it felt like they were only doing it to get more people in the theatre. I was never concerned about whether characters would survive the film because as the audience we never had enough emotional contact with them. I did still enjoyed this movie, but I can’t say it was anything that special. It’s unfortunate that two of my favourite actors, Ryan Gosling and Emma Stone, were in a movie of questionable quality, but oh well.